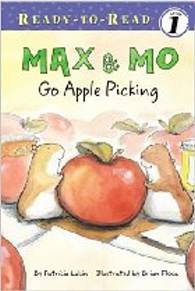 Max and Mo, those artsy classroom critters, are back in an autumn adventure--with apples! It all begins when Max and Mo experience a bit of ennui in the eateries department. It seems that the "Big Ones" who feed them are stuck in a rut--it's corn, corn, and more corn, morning, noon, and night, day after day. "NO MORE CORN!" they said. Max scratched his chin. "How can we tell them?" NEW FOOD! NEW FOOD! they shouted. But all is not lost! Soon Max & Mo spot a note on the blackboard. "We went apple picking," it says, and soon the hamsters' tummies begin to rumble at the thought of the fresh apples and homemade applesauce that they know will follow. "I cannot wait!" said Max. "Let's go!" said Mo. The two hamsters quickly pick the latch on their cozy cage and begin to explore the classroom for apples. "Not here," said Mo, as he crawls inside a an old left-behind sneaker. But just then the kids begin to return from their field trip, arms loaded with just-picked apples, and to their delight, Max and Mo watch an apple drop from one student's arms and roll into their hiding place beneath a table. When the school day is done, the two get busy sampling the left-behind goodies. "We're apple picking!" they said. But Max and Mo still have their beautiful dropped apple, and the two decide to split the bounty between them. Max grabs a knife and Mo holds the fruit steady and "Split," the apple pops apart and one half flips, cut-side down, and lands right in a dish of poster paint on the art room supply table. "Splash! Lift! Flip!" The apple half falls, paint-side down, on a piece of art paper. "We made an apple print! And the art room animals get busy making apple prints in all the colors in the paint box, and when the children return on their next school day, we know that their classroom will be decorated with wall-to-wall apple prints and two happy hamsters will be back in their cage, proud--and well fed! 3. Pour (water in pan)!